The guests of Nunavut’s caribou camps are flown directly from Thompson Manitoba to our main base of operations at The Lodge at Little Duck on board our chartered turbo prop King Air. This 275 mile flight takes approximately 75 minutes. Once at Little Duck, you will be transferred to a float plane for the breathtaking 45 minute flight north to one of the three Nunavut caribou camps. Nunavut’s caribou camps are very unique, intimate and boots on the ground hunting camps, situated on the tundra that will accommodate up to 8 hunters per week. These amazing hunting camps essentially puts you in the best possible location to hunt huge Trophy Caribou Bulls that are making their way south to their wintering grounds. You basically have the first opportunity at hunting these Caribou as they pass through the camping areas before any other outfitter or hunter has further south. We offer hunters the chance at harvesting a bull with rifle, bow or muzzleloader. Although our terrain is mainly tundra, it still offers excellent area of cover in terms of stands of spruce, tamarack, dwarf birch along outcroppings of rocks, natural ridges and draws that enable a hunter to either sit on “pinch points, or natural lake crossings”, but also lends to a “spot and stalk strategy” for that monster bull of a lifetime. Nunavut’s camps are permanent hunting camps, in that all structures are left standing year round. The buildings are Weatherhaven structures, which all agree are the Cadillac of all tent structures. Weatherhaven Structures are also the first choice of the U.S. military, mining companies, and commercial wilderness operators world-wide. They are fully insulated and have thermostatically controlled propane heat for your comfort. This is about as good as it gets in this part of the country. Guides will take their hunters by boat from one area to the next in search of trophy bulls. From time to time, your guide will beach the boat and take a short hike onto higher ground to glass miles of tundra for caribou. The rolling tundra is not hard to negotiate, and combined with the use of boats, allows us to tailor a hunt to an individual’s preference or physical ability. This hunt is 6 days in duration. Due to a 12 hour no hunt after flying rule in Nunavut, the first day is spent getting into camp from Thompson MB via our main lodge, sighting in rifles, scouting the area for the next day’s hunt, or fishing for some Lake Trout or Northern Pike. You will however have 5 full days of guided hunting following your arrival day. On the 7th day, you will depart for your trip home. 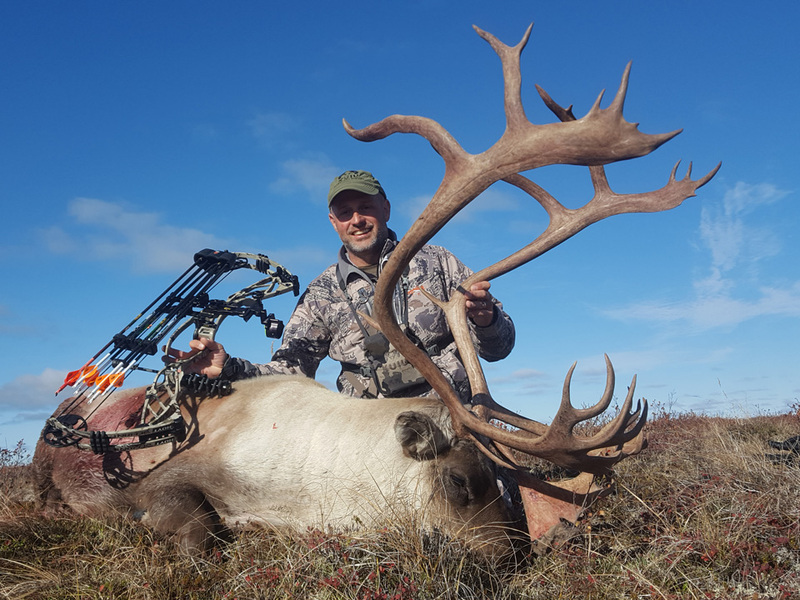 Our personal and reliable hunting guides come from the Arctic community of Arviat, and have many years of experience and knowledge both on the land and in hunting Caribou. These individuals are friendly, outgoing and true hunting professionals that take great pride in helping our guests make this hunting trip a once of a lifetime adventure. Come and discover the magic of Nunavut with us.